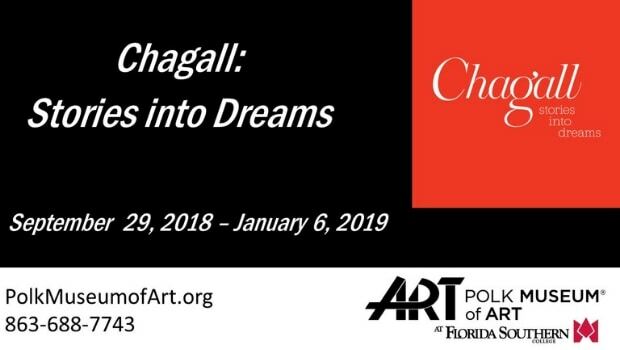 This extraordinary show of Marc Chagall’s work is the only one of its kind in Florida and the only one in the country that pairs his Fables of La Fontaine etchings (1952) with his Story of Exodus lithographs (1966). Marc Chagall (1887-1985) was born into a poor Jewish family in Russia and began studying painting at age 20, where his distinctive fantastical style centering on images from Russian folklore, family history, and his own childhood began to emerge. He moved to Paris for a brief sojourn between 1910 and 1914, where the influence of the leading Cubist, Surrealist, and Fauve painters of the time would leave an impact for the remainder of his career. In addition to recurrent motifs that evoke his Eastern European upbringing, much of Chagall’s artwork is influenced by universal themes of human morality, steeped deeply in allegory and religion. As in the case of this exhibition, Chagall often takes timeless stories — such as those from the Bible and famous fables — and provides dream-like illustrations for them in his inimitable manner. Featuring Chagall’s work in various media including painting, gouache, and lithography, Chagall: Stories into Dreams is a uniquely-curated show that takes viewers on an unforgettable artistic and historical journey through the artist’s beloved illustrations of the Fables of La Fontaine and The Story of Exodus.